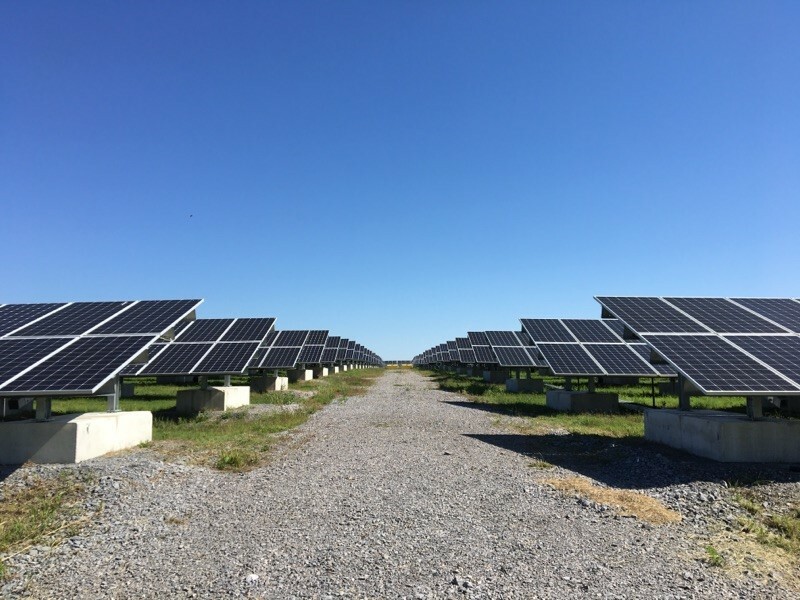 Friday, June 15th marked a monumental occasion for solar in the Commonwealth as the Kentucky Energy and Environment Cabinet (EEC) and Fort Campbell announced the completion of a five megawatt Solar Array Project at Fort Campbell—making it the largest non-utility solar array in Kentucky. It is also the first of its kind, as the solar project covers approximately 20 acres on an abandoned landfill on Fort Campbell and a collaboration of multiple partnerships that have made the five-year renewable energy plan a reality. Colonel Rob Salome, Garrison Commander at Fort Campbell. Photo by Eileen Hardy. The renewable energy project is a result of a unique partnership of the United States Army, the U.S. Army Corps of Engineers, the U.S. Department of Energy (US DOE), Pennyrile Rural Electric Cooperative Corporation (PRECC), BithEnergy, Inc. and EEC. “It took a lot of folks to make this project happen – from both the state of Kentucky, our many industry partners and our great department of public works,” said Colonel Salome. Installation on the solar array began in 2012 when Fort Campbell established a renewable energy plan, based on directives set forth in the American Renewable Energy Act requiring 25 percent of energy consumed by federal installations to be produced by renewable means by 2025. The Kentucky EEC awarded a $3.1 million grant in December 2012 to help launch the project’s first phase. Phase one included a 1.9 megawatt portion of the solar array, executed through a 10-year utility energy services contract with PRECC. The contract allows the electric cooperative to use the grant funding to pay for the solar array’s interconnection infrastructure. Fort Campbell received an additional $800,000 grant through the US DOE Federal Emergency Management Program to fund phase two. Funding is tied to a 27-year power purchase agreement. The project is unique on several fronts. First, it demonstrates how the Army is able to leverage both a utility energy services contract and a power purchase agreement to develop the solar array. The project consists of more than 16,000 solar modules constructed on top of a closed 20 acre landfill – demonstrating how underutilized properties can be put into productive service again. For Fort Campbell, the completion of the five megawatt solar array represents becoming one step closer to being energy secure and meeting outlined mission goals. Since forming, the unique project collaborative has assembled more than $10 million to support the project, including funding from the EEC and the U.S. DOE. The Solar Array Project will generate enough energy to power 463 homes, while avoiding 4,880 metric tons annually of CO2 emissions, all while strengthening America’s economic, energy and environmental security. Solar panels at Fort Campbell. Photo by Eileen Hardy.